Fantastic, opportunity to acquire this deceiving four bedroom detached home, modernised to a high standard and benefiting from gas central heating and double glazing throughout. In brief the property comprises, Modern kitchen, dining area, large lounge, four bedrooms with an en-suite to the master and the family bathroom. 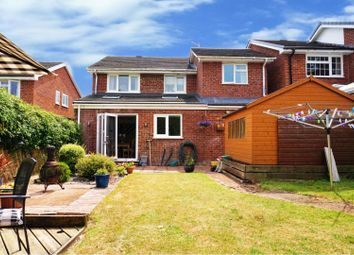 Externally to the rear is an enclosed mostly lawned garden with a sun house at the back as well as a decked area, great for entertaining purposes, and to the front is a two car driveway leading to the single garage. Carpeted, double glazed bay window to the front aspect, standard double glazed window to the front aspect, TV point, radiator, gas fire. TV point, partly wooden panels on the wall, TV point, radiator, tiled floor, bi fold doors to rear aspect, sky light. Two year old kitchen comprising; Base and wall units, plumbing and space for a dishwasher and washing machine, integrated; drinks fridge, fridge freezer, five ring gas hob, electric double oven and extractor hood. Stainless steel sink with shower head tap, tiled walls and floor, double glazed window to the rear aspect, sky light. Fitted mirror wardrobes, double glazed windows to the front and rear aspect, carpeted, radiator. Towel rail, partly tiled walls, low level WC, wash hand basin, large shower unit with double shower head, double glazed window to the rear aspect. Fitted mirror wardrobes, double glazed window to the rear aspect, carpeted, radiator. Fitted mirror wardrobes, double glazed window to the front aspect, carpeted, radiator. Double glazed window to the front aspect, carpeted, radiator, fitted wardrobe. Corner bath with shower attachment and shower above, towel rail, low level WC, wash hand basin, tiled floor and walls.